9x12, xcv + 281 pp. This critical performing edition of the earliest extant Hispanic opera, Celos aun del aire matan, presents the most extensive surviving example of Hispanic baroque theatrical music. Designed for the Spanish royal court’s festivities honoring the marriage of Infanta María Teresa of Spain and King Louis XIV of France, this passionate fiesta cantada in three acts was first produced in Madrid, thanks to the collaboration of court dramatist Pedro Calderón de la Barca (1600–1681) and composer Juan Hidalgo (1614–85). The opera was designed for performance by a cast of young female actress-singers (the only role requiring a male voice is for a comic tenor) and a continuo band. 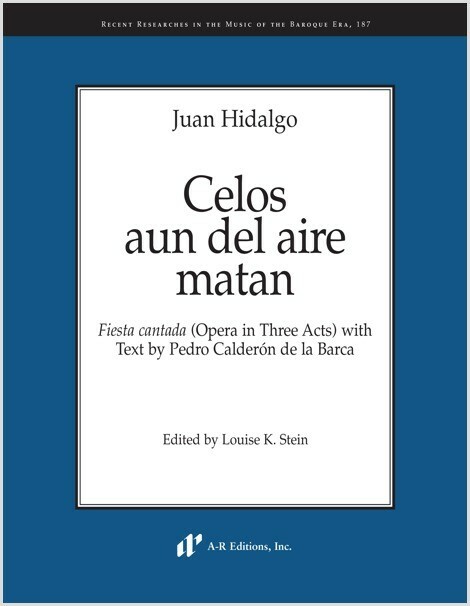 This edition, which includes an extensive introduction, an edition and English translation of the Calderón text, and a unique loa from the 1682 Naples production, contributes to a better understanding of Hidalgo’s music and the contribution of Hispanic music to early modern musical culture.